Highlands resident, Micah Nethercutt and a friend headed down to Jamaica Beach on Wednesday, June 25th to a stay at a beach house another friend had rented for the week to celebrate his birthday. The three friends spend the afternoon fishing the canal behind the house in the rain with no luck. The trio decided to get some raincoats and go fish San Luis Pass to see if they could change their luck. On the way to the pass, they talked about how they hadn’t had much luck catching any fish since signing up for the 2014 STAR Tournament. Upon arrival at the pass, they setup a few poles with bait to fish the surf to try and catch some sharks. Unfortunately, seaweed kept getting caught on the lines. Nethercutt decided to setup his other rod with a piece of squid and try his luck while his friends set up some lights as it was getting dark. Nethercutt was about to reel in his line due to the surf rolling the weight along the bottom, when suddenly his line took off. After landing the fish, he couldn’t figure out what was hanging off of its side as it was all covered in algae. Upon further inspection, Nethercutt realized the fish was a tagged redfish, TA589 for the 2014 CCA STAR Tournament. He immediately put the fish in an ice chest to keep it safe. Needless to say, Nethercutt was too excited to fish the rest of the evening. 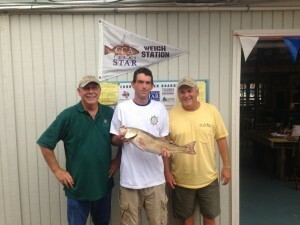 The following morning, Nethercutt contacted the STAR Tournament office to notify them of his catch, then headed over to official STAR weigh station, West End Marina to weigh-in his winning tagged redfish. Micah Nethercutt is the first official winner of the 2014 CCA Texas STAR Tournament, Texas Ford Dealers Redfish Division. He will receive a 2014 Ford F-150 Texas Edition XLT SuperCab truck, Haynie 23’ Big Foot boat, Mercury 150 L Pro XS OptiMax motor and Coastline trailer.